Aggression is part of South African society and has implications for the mental health of persons living in South Africa. If parents are aggressive adolescents are also likely to be aggressive and that will impact negatively on their mental health. In this article the nature and extent of adolescents' experiences of aggression and aggressive behaviour in the family are investigated. A deductive explorative quantitative approach was followed. Aggression is reasoned to be dependent on aspects such as self-concept, moral reasoning, communication, frustration tolerance and family relationships. 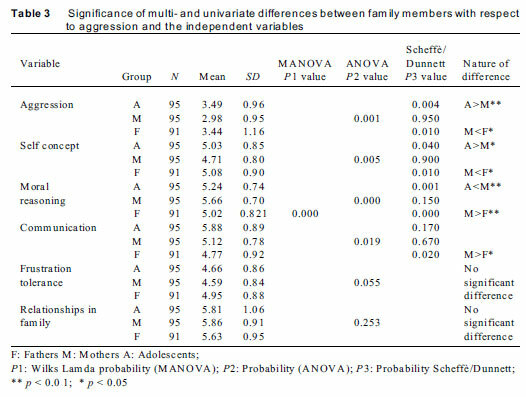 To analyse the data from questionnaires of 101 families (95 adolescents, 95 mothers and 91 fathers) Cronbach Alpha, various consecutive first and second order factor analyses, correlations, multiple regression, MANOVA, ANOVA and Scheffè/ Dunnett tests were used. It was found that aggression correlated negatively with the independent variables; and the correlations between adolescents and their parents were significant. Regression analyses indicated that different predictors predicted aggression. Furthermore, differences between adolescents and their parents indicated that the experienced levels of aggression between adolescents and their parents were small. Implications for education are given. Aggression is described as "an unprovoked act; the first attack in a quarrel; an assault" (The South African Oxford Dictionary, 1986:14; Felson & Tedeschi, 1993:52). Felson and Tedeschi (1993:58; see also Naicker, 2009:21) state that aggression is "an act that injures or irritates another person". According to Feldman (2001: 299) aggression is "an intentional injury or harm to another person", an intension to hurt or to cause damage (Passer & Smith, 2007:648) and is behaviour that is meant to hurt another person in a physical or verbal manner or to destroy another person's property (Atkinson, Atkinson, Smith & Bem, 1993:438). Sadock and Sadock (2007:149) state that "Aggression implies the intent to harm or otherwise injure another person, an implication inferred from events preceding or following the act of aggression. Behaviour can be aggressive even if it does not cause physical injury. Aggression includes verbal aggression, coercion and intimidation that cause harmful psychological effects on individuals. The importance of these behaviours should not be underestimated. They affect individuals' self-esteem, social status, and happiness negatively(Sadock & Sadock, 2007:149). Myburgh and Poggenpoel (2009:445) mention that it is not necessarily actions or observable behaviour that should be labeled as aggression, but the intention or motivation behind aggressive conduct that especially determines whether behaviour is aggressive or not. In this article, aggression in a family is viewed as any form of action experienced as harmful. Aggression takes many forms such as emotional abuse, verbal abuse, physical abuse and psychological abuse. It includes physical assaults, such as hitting, kicking, biting and shoving, and verbal assaults such as making threats, hurling insults, and name-calling (Du Plessis, 2010:3). Even subversive, underhanded behaviour from family members meant to annoy or pester another person (Naicker, 2009:19) are considered forms of aggressions. Wallach (1996:115) says: "Aggression is inborn (and) as an instinct it supplies the physical energy for maturation, learning and the exploration of the outside world". Aggression can be seen as the way in which an individual expresses frustration and tension in a physical, a verbal or indirect manner. Aggressive behaviour as such should not necessarily be seen as negative or violent. It is an inherent part of every human being. Aggressive behaviour can be functional and constructive in the sense that that it promotes and protects mutual values in a community. Johnson (2006:306) also mentions that aggression can either be constructive or destructive and that constructive aggression may lead to the experience of energy, motivation, challenges and excitement. The general use of the term aggression normally refers to verbal or non-verbal behaviour that is intended to offend another person. To a lesser or greater extent every person experiences frustration, irritation, anxiety, disappointment, tensions and aggression in life (McKay, 2005:35). The way aggression is expressed and managed through behaviour and communication, has important implications for the mental health of those involved, especially in the family. The implication of this is that aggression is part of everyday life and is therefore part of South African society. Suáres-Orozco (2000:8) states that aggression and possible ensuing violence can have an economic foundation. These economic powers can cause social violence (Weiten & Loyd, 1997:14; Van der Walt, 2007:290). This does not mean that the high levels of violence, crime and abuse that are aggravated by socio economic factors such as poverty, unemployment, corruption, political division, high divorce rates, affirmative action, crime, illiteracy, road rage and even family violence are acceptable or should be tolerated. It is clear that aggressive behaviour is a complex phenomenon and can be seen as a symptom of many of the mentioned socio economic problems. Aggression in day-to-day living should not be underestimated, nor should its effect on the individual's self concept, social status, and happiness (Sadock & Sadock, 2007:149). The family is an important context for primary socialisation of children. Parental style, as well as aspects such as communication and conflict management is part of the environment where the child's upbringing takes place. Early aggression in the family can lead to violence in life (Du Plessis, 2010:5; Natale, 1994:38). The nature and extent of adolescents' experiences, assessments and management of aggression and aggressive behaviour within the family are the focus of this article. Different persons in the same situation view, experience and assess aggression differently. Research in this regard is absent in the South African literature. A prominent question is: "How do adolescents and their parents assess their own views and experiences of aggression and aspects relevant to aggression in the family so that these self assessments can be used to facilitate the mental health of family members and especially adolescents?" In order to address this question a deductive approach was followed. Within the context of this article a conceptual framework was formulated by utilizing existing research literature. In this article we explore and describe the self assessments of adolescents and their parents (fathers and mothers) concerning their experiences of aggression in the family in order to facilitate the mental health of adolescents and their parents. The focus is on the adolescent's perspective. An individual's experience and accompanying self assessment and self perception of aggression cannot be viewed in isolation. It is a person experiencing aggression and it depends on other individual aspects relevant to the person within the family context. Nuances of experiences of aggression and the self assessment of experiences of aggression are amongst others dependent on the person's self concept, level of moral reasoning, communication, frustration tolerance and relationships in the family. Self concept: is prominent in self perception and self acceptance of an individual in a variety of ways and areas, such as academic, physical and social (Gladding, 2000:388). According to Gerdes (1988:388), these are different for different persons. The self concept reflects self reliance and specific assumptions of persons about themselves (Myers, 1999:39), such as motivations about abilities to achieve (Grobler, 1996:234) and views on own health status. A person with a positive self concept will be at low risk to be aggressive (Sadock & Sadock, 2007:151). McKay (2005:34) stresses that a person who experiences inadequacy and inferiority, often feels threatened and powerless. McKay states that anger and aggression can manifest as a form of protest and a way of being temporarily powerful. Both the self concept of the parent and the adolescent will have an influence on the value and the meaning that are being attached to the interaction that takes place amongst family members (Du Plessis, 1999: 63). Feldman (2001:120) reiterates that an adolescent's selfconcept is established by observing his/her own behaviour as well as the behaviour of other persons and then judging that behaviour. Lippa (1994:84) in agreement with this stance states that "people develop selves only by incorporating the perspectives of other people". The most important role model in the family should be the parent and the atmosphere at home should be conducive to acquiring or learning behavioural patterns, values and norms (Cartledge & Milburn, 1988:47). Jordaan and Jordaan (2005:671) state that security within the family is reflected in the trust, closeness, accessibility and consequently the meaningfulness that the adolescent experiences in the family. The formation of relationships is dependent on self awareness, self knowledge, self understanding and self revelation (Johnson: 2006:46). It is in the family that interaction with other persons of the same and opposite gender is taking place through living together or participating in recreational activities, thus influencing the self image of an individual. Through the self concept an individual's behaviour is self regulated and shaped in view of the demands of different social situations (Johnson, 2006:53). In the family experiences of trust, closeness, accessibility and meaningfulness are manifested (Jordaan & Jordaan, 2005:671) and should be reflected in the family members' experience of aggression. It is therefore expected that the self concept of individual family members will play a role in the levels and experiences of aggression. Level of moral reasoning: Aspects that contribute to a person's level of moral reasoning are amongst others cultural values, preferences, standards, characteristics, rules, prescriptions, religion and traditions of the community to which a person belongs (Hook & Watts, 2002:276). Gerdes (1988:320) reasons that the values and fundamental convictions of a person are anchored in the socio-historical background of the person. Moral reasoning reflects evaluations and judgement of behaviour and is described as right, wrong, decent, proper, good, bad, acceptable and unacceptable (Gladding, 2000:52). Louw (1990:431) mentions that the level of moral reasoning of an adolescent is dependent on the parent's actions and attitude towards the adolescent; the values and behaviour restrictions of the adolescent's peer group; religion as source of moral responsibility, expectancy and the experience of security, gender of the adolescent and role-orientated behaviour, as well as the stereotype expectation that is associated with it. Kohlberg (Slavin, 1991:45-54) reasons that an adolescent probably starts functioning on the post-conventional level and is usually busy defining own values and ethical principles with respect to social interaction. During adolescence the realisation takes place that laws and values are somewhat arbitrary and relative within each society (Slavin (1991:54). Although the moral judgment of adolescents is still not fully developed, they possess the potential for moral insight, moral decision-making and moral behaviour that correlate with this insight (Gunter, 1982:87). It is expected that the level of moral reasoning will play a role in the adolescent's ability to trust in others persons, assessing own behaviour, identification with parents, experiencing frustration with rules and discipline, relying on rules and discipline for security, adhering to rules and prescriptions, transgressing of prescriptions by others, living prescriptively according to religion, and gauging of oneself according to prescription by religion and the experience of aggression and anger when reprimanded (Du Plessis, 2010:43-48,126). It is expected that the level of moral reasoning in the family can be used to predict the aggression of the adolescent and parents. Communication: According to Gladding (2000:305) all acts of behaviour can be seen as communication. Interpersonal communication has two functions, namelyto transfer the content of the message but also to establish a specific relationship or to strengthen an existing relationship between sender and receiver. In the family a prerequisite for communication is that interaction takes place between family members and that a willingness to listen to each other and treat each other respectfully should be present in the relationships. Opportunities and a readiness to state one's case within the family should exist. Individuals strive to establish their own identities and they desire to be valued and acknowledged. This refers to a desire to be part of the family and to share in the emotional interdependency within the family. In the family all carry the responsibility for cohesion. Myers (1999:516) states that "Conflict signifies involvement, commitment and caring and if it is understood and recognised, it can renew and improve human relationships". This reiterates the above statement that all aggression is not necessarily negative and aggression can also be an indication of involvement. Further, it is imperative to stress that self concept, moral reasoning, tolerance of frustration and relationships in the family are dependent on communication. It is expected that communication in the family would predict aggression. Frustration tolerance: Kauffman (1994:37) is of the opinion that although the individual possesses certain biological functions and predispositions to aggressive behaviour, a person also has the ability to control and manage aggression productively and proactively. This skill to tolerate frustration and aggression is transferred from parent to child (Haralambos & Holborn, 1991:4). This is when accepted norms of society become guidelines for acceptable behaviour (Bandura, 1992). The risk of an individual being aggressive is lowered by the ability to cope with stress and irritation (Sadock & Sadock, 2007:151). Aggressive behaviour, tolerance and management are learned through observation of role models (Bandura in Feldman, 2001:303; Myers, 1999:421) such as parents in the family. In the family children also become aware of perceptions with regard to them (Locke & Chiechalski (1995:52). Within the family parent and child are involved with each other and this unique relationship forms the primary relationship for all further relationships of the adolescent. Jonathan (1997:147) says that "We are social creatures on grounds internal to ourselves - that our individuality results from an interaction between the internal and the external which is a continuous feedback loop". Children find themselves continuously within a social context whether it is the family, the peer group or the society. The atmosphere in family should provide ideal opportunities for children to learn from parents (Beck, 1967) and to tolerate frustration and aggression. In the family adolescents can engage with each other in a meaningful and independent way. Feldman (2001:343) stresses that role identification is more than regulation of behaviour. Normative social pressure is exerted on an adolescent to act with acceptable behaviour and expectations. The experience and tolerance of frustration and aggression in the family will necessarily influence the adolescent. The multidimensionalityand multi-contextuality of violence and aggression are illustrated by Suàrez-Orozco (2000:1) who states that it targets the body, the psyche, as well as the socio-cultural order. Sigelman and Rider (2006:427) indicate that region and social class of family influence the patterns of socialization; that is disciplining in accordance of values and expectations. If the adolescent is a perfectionist, bad loser, evading competition, is frustrated by school work, frustrated by own finances or adapts readily to new circumstances, this will manifest in the experience ofaggression. Further, being jealous, perseverance, competitiveness, leisure habits concerning television and being "sucked" into aggression on television or having somebody else to talk to outside the family circle should all play a role in the development of tolerance for frustration (Du Plessis, 2010:61-82,130). It is therefore expected that the ability to tolerate frustration will predict aggression. Relationships in the family: The parent-child relationship is primarily nurtured in the family, where children are recognized, loved and treated as individuals (Sadock & Sadock, 2007:151). Within families children can be exposed to aggressiveness in relationships. Prinsloo and Neser (2007:325) mention that parents and caregivers can openly allow or even encourage aggressiveness or aggressive behaviour can be discouraged or cautioned. The example of the parent whom the adolescent observes can become a determinant in predicting the nature of the child's behaviour. It is through mutual respect, mutual interest, cooperation and time spent together in the family that the management of aggression can be successful or not. The ability to interact in a nuanced and respectful way can contribute towards the management of the levels of aggression. It is therefore expected that relationships in the family will predict aggression in a family. These five aspects (independent variables) and aggression were incorporated into a questionnaire. This investigation followed a quantitative research strategy that was contextual, descriptive, analytical, and deductive in nature. The questionnaire was based on the conceptual framework above and it was used to gather the data from the participants (Du Plessis, 2010). The ethics, sample selection, validity and reliability of the questionnaire, and the statistical procedures are described. Ethical measures: such as autonomy, beneficence, non-maleficence and justice were adhered to throughout the research process (Dhai & McQuid-Mason, 2011:14-15; UNESCO, 2009:23-32). The participants consisted of parents and adolescents. Permission was requested from parents for their children to participate. Adolescent children were asked for their assent to participate. The participants were invited to fill in questionnaires voluntarily and were assured that they could withdraw from the research at any time. Individual participating family members filled out the questionnaires anonymously. The participants benefitted by completing the questionnaire, through the opportunity to reflect on their own behaviour and experiences and those of others. Questionnaire, sampling and sample realization: Based on the conceptual framework, a questionnaire consisting of 85 question items concerning the various independent variables and aggression (dependent variable) was developed. The different variables, as discussed in the theoretical framework of this article, were used to formulate the question items. Aggression, for example, was operationalized in a question "Are you like a bomb that wants to explode?" Moral development was operationalized in a question "Do people trust you?" Self-concept was operationalized, for example, with a question "Do you have confidence?" Communication and conflict management were operationalized in a question "Do you shout at each other in your family? ", and family, for example, "Do you spend time with your family?" (Du Plessis, 2010:124-131). In this article data on 76 items were used. A seven point scale for each of the 76 items, ranging from "Not at all" to "To a large extent", was provided to participants to assess and report their own experiences. Adolescent learners in Grade 11 and their parents from two secondary schools in the same region were invited to participate in the investigation. The parents and adolescents independent from each other completed questionnaires. In total 101 families (101 fathers, 101 mothers and 101 adolescents) participated. Eventually the data of 95 adolescents, 95 mothers and 91 fathers could be used in the further analyses, i.e. 92.7% [=(303-22)/303*100%] of the participants' data. Thirty-four adolescents were male and 67 female. Validity and reliability: These were investigated in a variety of ways. Firstly, content validity (Vockell & Asher, 1995) was assessed by checking that the various relevant aspects in the conceptual framework concerning aggression and the independent variables were reflected in the question items. Further, preliminary analyses concerning construct validity (Vockell & Asher, 1995) was executed by applying various first order and consecutive second order factor analyses. Cronbach Alpha coefficients were calculated concerning the various identified factors to enable preliminary assessments on the reliability of the questionnaire and the investigation (See also Du Plessis, 2010:133 a.f.). A Cronbach Alpha coefficient of 0.5 or more is an indication of acceptable reliability (Bless & Higson-Smith, 1995:87). Construct validity was further clarified by comparing the various factors identified during the analysis of the data. The final results of these analyses are presented in Table 1. The variables in Table 1 form the basis for the multivariate and univariate differential analysis. Concerning validity and reliability, these variables are accepted as content valid and to a certain extent also as construct valid. However, further research in this regard is necessary. Statistical procedures: Those followed during the data analysis were twofold: Firstly, the significance and substantiality of interrelationships between the six identified variables were investigated. Correlations (Field, 2005) were used. The significance of the correlations between aggression and the identified independent variables was investigated. Thereafter, the correlations per variable between adolescents, their mother and the adolescents and fathers were investigated. In view of the significant correlations between aggression and the independent variables, multivariate regression analyses were calculated with the independent variables as predictors of aggression. Secondly, the significance and substantiality of multivariate and univariate differences between the adolescents and fathers; and adolescents and mothers were investigated. The three vectors of means of the three groups (adolescents, mothers and fathers) were compared with a multivariate analysis of variance (MANOVA) (Field, 2005). The vectors consisted of the means of the five independent variables and the means on aggression. The focus of these analyses was from the adolescent's perspective. If a significant multivariate difference was identified, the multivariate analysis was followed by univariate analyses of variance (ANOVA). These analyses entailed the testing of hypotheses for differences between the means obtained by adolescents, their mothers and their fathers for each of the six variables (aggression and the five independent variables). If a significant difference was indicated on the univariate level, the specific differences were tested between two specific groups, namely, between adolescents and their mothers; and between adolescents and their fathers. These analyses were conducted for each of the six variables. Hypotheses concerning relationships and differences were tested on the 0.01 and 0.05 levels. Thereafter, substantiality of findings was assessed. In view of the descriptive nature of the analyses, no effect sizes were used. In this section the findings are presented in accordance with the testing of hypotheses concerning interrelationships between the independent variables and aggression. Thereafter, hypotheses concerning the differences between the three groups of participants from the adolescent's perspective are tested. This is followed by a descriptive integration of the findings to present a differential pattern of the interrelationships and differences between adolescents and their parents concerning the experiences of aggression. Interrelationships between independent variables and aggression: In the following section the analyses will indicate that when the participants have a high average on the independent variables the average level of aggression will be low and vice versa. Secondly, when the parents' average level of aggression is high, the adolescents' average level of aggression will be high and similarly when the level of aggression of the parents is low, that of the adolescents will also be low. Finally, for the mothers, the fathers and the adolescents, different combinations of independent variables will predict the level of aggression. Various correlations were calculated for the different groups with respect to relationships between the independent variables and aggression. This was finally concluded with multivariate regression analyses. It was identified that in all cases significant negative correlations exist between the independent variables and aggression on the 0.01 level. These correlations are also substantial. In concrete terms, the total of 20 correlations of the total group (N = 281); adolescents (N = 95); mothers (N = 95); and fathers (N = 91) indicated that there is a negative correlation between aggression and each of the five independent variables (Du Plessis, 2010: 153 a. f.). These findings indicate that, when participants' self-assessments are high on each of the five independent variables, aggression is low and vice versa. 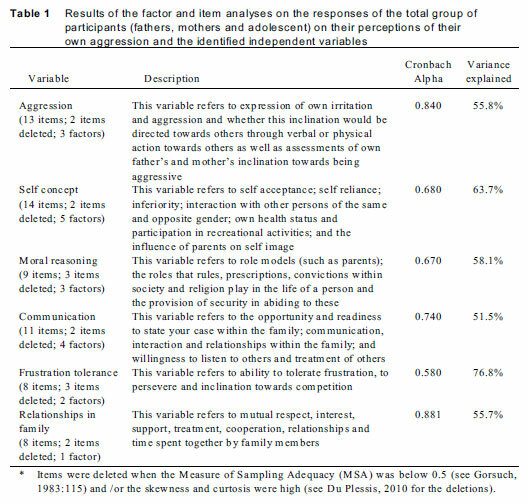 Secondly, the significance and substantiality of relationships between the adolescents and their parents with respect to the six variables, that is aggression and the five independent variables (Table 2) was investigated. In this case positive correlations between adolescents and parents concerning all the variables exist on the 0.01 (**) or 0.05 (*) level of significance, except for moral reasoning between adolescents and fathers. Thirdly, multivariate regression analyses (Field, 2005) were conducted with the independent variables as predictors of aggression. The above analyses with regard to interrelationships (correlations) between the variables indicated that the independent variables correlate significantly negatively with aggression. Secondly, the self assessments of adolescents and mothers; and adolescents and fathers correlate significantly positive with each other with respect to the six variables. The derivation was therefore made that the independent variables can be used as predictors for aggression in the sense that when addressing the issues reflected in the independent variables, an impact is expected on the level of aggression of the involved individuals. This is not applicable to moral reasoning, where no significant correlation between adolescents and fathers was observed. It was concluded from the correlations and the regression analyses that if adolescents scored higher on moral reasoning and frustration tolerance; if mothers scored higher on moral reasoning and communication; and if fathers scored higher on frustration tolerance and communication then aggression was scored lower and vice versa. To conclude the findings on interrelationships: It is clear that for the three groups of participants aggression correlates negatively with the independent variables; and the correlations between adolescents and their parents on each of the variables are high. The regression analyses indicated that different predictors are relevant in predicting levels of aggression. These differentiations and nuances should be taken into account when interventions concerning the experience of aggression are made. From the following section it will become clear that there are no differences between adolescents and their parents concerning their perceptions of their own aggression. The three groups have high averages on all the independent variables and low averages on aggression. The significance of multi- and univariate differences was investigated between the three groups of participants with respect to aggression and the five independent variables (Table 3). The multivariate analysis of variance (MANOVA) indicated a significant multivariate difference at the 0.01 level (P1 value = 0.000) between the three vectors of means for the three groups, i.e. between adolescents, mothers and fathers. The vectors of means consisted of the six variables, namely, aggression, self- concept, moral reasoning, communication, frustration tolerance and relationships in family. Following the identification of this significant multivariate difference, the analysis proceeded by investigating the significance of differences between the three groups per variable. In this case an analysis of variance (ANOVA) between the three groups on each of the six variables indicated a significant difference at the0.0 level for aggression (P2 = 0.001); self concept (P2 = 0.005); moral reasoning (P2 = 0.000); and at the 0.05 level for communication (P2 = 0.019). No significant differences between the three groups were identified for frustration tolerance and relationships in family. The significant differences identified through the application of the ANOVA were then further investigated through the application of the Scheffè or Dunnett post hoc test. For these analyses adolescents in comparison to the mothers had a significantly higher mean on aggression (0.01); a significantly higher mean on self concept than mothers (0.05); and a significantly lower mean on moral reasoning than mothers (0.01). No significant differences between adolescents and their fathers were identified. On inspection of the sizes of the means obtained by the three groups on a seven-point scale, it appears that the experience of aggression for all three groups were assessed lower than 3.49; self concept higher than 4.71, moral reasoning higher than 5.02, communication higher than 4.77, frustration tolerance higher than 4.59 and relationships in family higher 5.63 (see Table 3). The relatively high means on the independent variables could provide an explanation for the relatively low means on aggression. The deduction is that if aspects of self concept, level of moral reasoning, communication, tolerance for frustration and relationships in the family are highly valued, the levels of aggression will be relatively low. The aim of this research was to investigate the role and importance of the family in the nurturing of the mental health of adolescents. The means obtained on the variables thus indicate a healthy mental state of the participants. This is based on adolescents' and parents' self assessments of their experiences of aggression in the families. To conclude, differences between the three groups, i.e. between adolescents and mothers, and adolescents and fathers, concerning aggression and the independent variables are merely differences of degree rather than substantive differences. Further, the significant differences are between adolescents and mothers. Differences between means are not substantial. This article focuses on differences from the perspective of the adolescent. Overall it appears that the experienced levels of aggression between adolescents and parents are small and possibly indicative of a healthy situation in these families. This conclusion is based on the fact that the means of aggression are fairly low and the means on the independent variables are relatively high (see also the analyses on correlations and the multivariate regression analyses). In conclusion the analyses indicated that when the participants have a high average on the independent variables the average level of aggression will be low and vice versa. Secondly, when the parents' average level of aggression is high, the adolescents' average level of aggression will be high and similarly when the level of aggression of the parents is low, that of the adolescents will also be low. Finally, for the mothers, the fathers and the adolescents, different combinations of independent variables will predict the level of aggression. Furthermore, it became clear that there are no real differences between adolescents and their parents concerning their perceptions of their own aggression. The three groups have high averages on all the independent variables and low averages on aggression. The educational implications are that the levels of aggression in a family are dependent on a number of prominent aspects of everyday living. A person's self concept isolated from the context of moral reasoning, frustration tolerance and communication is inconceivable. Du Plessis (1999) found that a relationship exists between the self concept of children and their parents. It is assumed that when research is conducted on the other identified independent variables of aggression, a similar relationship between family members could be identified. Interaction in the family can thus not be ignored. In essence, if the self concept of a family member is not nurtured within the family context of moral reasoning, communication and tolerance of frustration, aggression can be expected. It is clear that an interrelationship exists between the contributing variables and aggression within the sample. However, in spite of this strong interrelatedness between family members on the various contributors to aggression, definite and specific differences between the adolescents and parents exist. Itappears that adolescents and fathers do not differ significantly. This is in spite of the fact that different variables predict levels of aggression for adolescents and fathers. Furthermore, different variables predict aggression for mothers and adolescents and adolescents differ from mothers in that they have a higher aggression level, a higher self concept and a lower level of moral reasoning. In addressing aggression in the family, adolescents should be assisted differently from parents and special attention should be paid to the relationship between adolescents and mothers (Du Plessis, 2010:168-175). More and more emphasis is placed on the emotional stability of individuals as well as on an ability to build and maintain healthy interpersonal relationships (Johnson, 2006:13). One of the skills that an individual should attain is that of handling and dealing with aggression, whether it is own aggression or aggression that is directed at an individual (Grey, 1993:45). This particular social skill is mainly based on meaningful and effective communication and without it, virtually no relationship can be established or maintained (Du Plessis, 2010: 239; Friel & Friel, 2000). This aspect should mainly be addressed within the family because it is here that the child (adolescent) should learn how to manage aggression positively and constructively. Adolescents should be assisted to manage aggression explicitly and constructively (Du Plessis, 2010:187). The explication and development of mentally healthy relationships (Johnson, 2006:13), that are implicitly already present in this specific sample of participants, is imperative. The constructive management of aggression as well as improving interpersonal communication skills (Johnson, 2006:15) can be used in almost any situation where people are interacting with each other. Family meetings could be an excellent instrument to promote healthy interaction within a family and optimally facilitate the mental health of adolescents and parents. Chris Myburgh has been Professor at the University of Johannesburg for more than 30 years and a widely published researcher. Marie Poggenpoel has been Professor at the Universityof Johannesburg for more than 30 years and a widely published researcher. Dorothy du Plessis is in private practice and her focus is on facilitation of constructive family relationships.